Growing up in a society where it was inconceivable for men and women to fight together, Kurdish YPJ female forces engaged in combat against the Islamic State, have been starting their own revolution. They told RT their previously undocumented stories. RT filmed a unique documentary “Her War: Women Vs. ISIS” about young Kurdish women in Syria, who are defending their country against the Islamic State (IS formerly known as ISIS/ISIL) militants. For three weeks the RT Documentary team lived in a training camp run by the YPJ, on the border with Iraq, three kilometers from the frontline. Gulan, 18, from the predominantly Kurdish town of Serekaniye, which borders territories controlled by IS, said that she took up arms to protect her family. The Kurds are an ethnic group, culturally and linguistically related to Iran, which does not have its own state. The Kurdistan region spans adjacent parts of Iran, Iraq, Syria, and Turkey. “I’ll go fight the enemy to keep my father safe at home and make him proud,” she said as she was leaving to train to become a fighter. IS militants on the rampage in Syria and Iraq, have kidnapped hundreds of women and young girls. They have committed numerous atrocities, which include abuse, forcing them to convert to Islam and marry the jihadi fighters. Following the capture of Palmyra, IS militants now have half of Syria under the control along with significant parts of Iraq. The Kurds have been fighting various jihadi groups, including IS, since July 2013. The militants have committed numerous acts of genocide against the Yazidis, a Kurdish minority in Iraq, in a campaign they believe will “purify” the territory from non-Islamic influences. “For IS militants being killed by a woman means going to hell,” said Chichek, 16 years old. She ran away from home in Turkey to join the YPJ after her parents tried to force her into an arranged marriage. He said that the YPJ women want to create a “new society”, adding that before it was “unthinkable” for men and women to be friends or fight together. 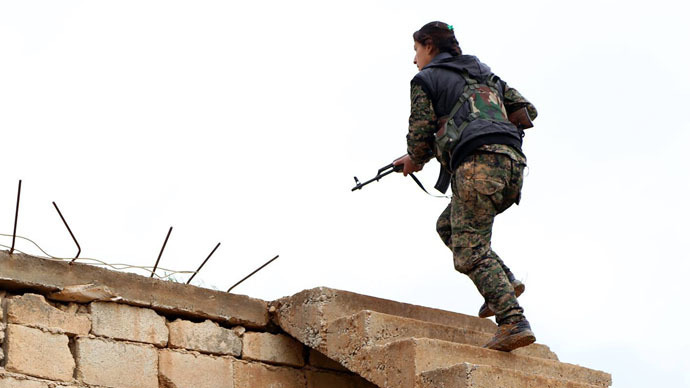 “These women joining self-defense forces in Syrian Kurdistan is a revolution within a revolution,” he added.